Photo album with amazing 3D flipping effect and motion blur. 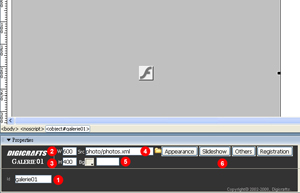 The technology of PhotoFlip now comes to Dreamweaver Extension. Galerie 03 helps you to build a 3D photo album within 2 minutes. No more script, no more HTML code! Over 20 parameters to customize in properties inspector. Everyone can create unique album to fit in their design. Save a lot of workflow time when use with Adobe PhotoShop. Galerie 03 supports build gallery from PhotoShop. 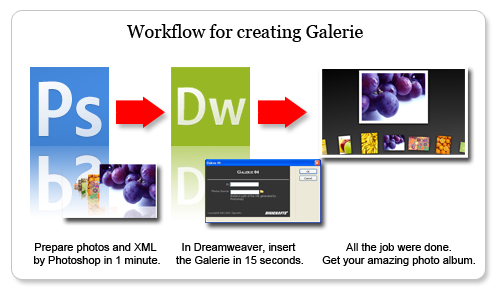 Use the Export Web Gallery function in PhotoShop and use the gallery with Galerie 03.